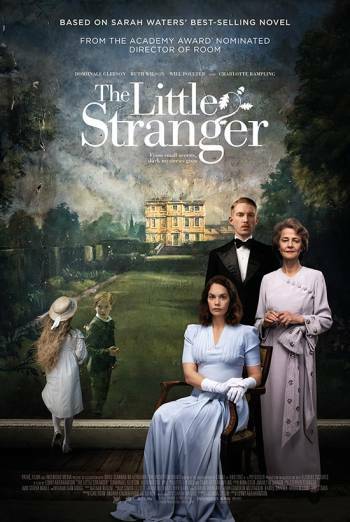 Summary THE LITTLE STRANGER is a British mystery drama, set in the 1940s, in which a country doctor is called to treat a patient at a crumbling estate. THE LITTLE STRANGER is a British mystery drama, set in the 1940s, in which a country doctor is called to treat a patient at a crumbling estate. There are scenes of moderate threat in which people are frightened by banging doors and other strange sounds, possibly resulting from supernatural activity. We see blood over a distressed child's face and clothing after an off-screen dog attack. There are further bloody images in the aftermath of a possible suicide and of another incident in which a character falls from a staircase. In another scene we see electrotherapy being applied to a man's heavily scarred leg. There is infrequent strong language ('f**k'). Milder terms include 'bloody' and 'damn'. A man slides his hand up a woman's inner thigh during a romantic encounter. There is a brief verbal reference to a man beating his young daughter in order to terminate her pregnancy. A dog is euthanised.